After the storm destroyed the Ampair 100 that was on this mast, a neighbour bought a Hornet from http://windgenerator.org.uk/ This is the 8-blade 1250 watt version. Apparently it has been seen producing 1251 watts into a 24 volt battery “in the bottom of a valley”. Which I assume would be about 40 amps and 30 volts. 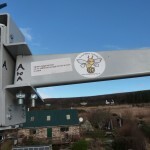 However this is one on Scoraig is connected to a 12-volt system. Having said all of that it’s an affordable little unit and when I went to look at it in a good stiff breeze it was purring along producing a respectable 50-100 watt output. Let’s see how long it lasts. 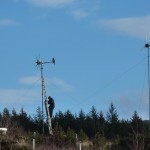 This entry was posted in products/technical, Scoraig, UK small wind scene. Bookmark the permalink. Hi Everyone Until recently I was considering a Hornet turbine from UK but now I think I will just get my old turbine fixed. I live on the Cambrian Mountains,Mid-Wales and Iam off grid,I currently have an old chinese turbine (around 10 years old now) It has never failed until recently when a bearing in the yaw retired and the original slipring cracked,I sourced the parts via China and will be fitting soon. It was recently producing around 500w and showing 50Amp on the ammeter,It stayed out in very high winds and has blown the 100A inline fuse before now. I have used other modern chinese turbines but they have not been anything like this old one. I think it is down to the person,what is good for one is rubbish for someone else. I will still be looking around but will not be rushing to get the best sounding or or most braggiest. I have a hornet wind turbine 48v 8 green blades charging a 940 ah fork lift battery along with 3.6kw of solar panels. In the recent December storms in the UK I have seen over 20+ amps at 50+volts in 35-45 mph winds which according to my maths is over a 1000w . Appreciate your comments regarding the Hornet you purchased and the fact it survived a gale in the UK. Can you expand on the average wind speed/ amps you are seeing with the model of PMA ? characteristics, and if it is in the circuit the efficiency goes up. Thanks Hugh, So what do you advise for my operation in your opinion as I have an electrical background but its irrelevant , I cant decide as there is so much stuff out there . Regards. Has anyone any views on the LE Turbines (leading edge)?? Im looking for something around 1500 watts to run a 200 watt pond pump and 100 watt uv steriliser. Im based in southern Ireland and should have fairly moderate wind speeds. Id just like something reliable that would do the job and not be a disappointment. I have some reservations based on past offerings from this designer and from seeing what happened on a couple of high wind sites but I also hear they do OK on low wind sites. For the record, the hornet is still doing fine. The owner has tinkered with it quite a bit but it has not suffered any big failures yet that I am aware of. Very glad to have stumbled across this blog doing some research on comparison between these above named companies. I am based in the Algarve, Portugal and will be purchasing from ‘none of the above’ and save the import duty. So, I would ask the question “where would you spend your £500” knowing you don’t have the time or the necessary skills to build one? Aside from all the unpleasant strife that surrounds these turbines I have to say that the actual experience of this particular machine here has so far been positive and i am pleasantly surprised by how well it has worked and the stuff it has survived to date since January. It’s not easy to make a good small wind turbine for the commercial market, especially if it is then sited on a windy site with turbulent periods. With only £500 to spend you are restricted to the marine/leisure products on the one hand (Marlec Rutland, etc) which are rather small, and the Chinese stuff on the other, which have a terrible reputation for poor quality on the whole. If you are a hands-on person then I’d recommend going for a chinese machine or a Hornet (probably mostly made in china actually) and being ready to take it apart and fix it. If you want to fit and forget then a small turbine designed for a boat may be your best option. But if your site is very windy you can have problems with pretty much any product, whereas in low winds they are likely to be reliable but unproductive. I am going to do like many are doing and jump up to a Axial Flux if I can figure out your math. I live in Texas, and I have numerous of these car alternators that are being used in VAWT mount and I can attest that they are all the same thing. The Missouri one is identical inside as a Thermodyne Hornet, and same as a Hurricane wind, and same as a Wind Blue. these guys are just changing the case or rotor or how the winding sets. All of them are chronic liars actually and its a shame all they can do is claim bad on the other makers to try to sell theirs instead of actually making a real good item. I like you see the guy in Missouri is just dressing it up and renaming it. But his does mount well on a build. It just won’t ever put out anything like he claims. The Wind Blue I have is ok, and makes consistent power but is hard to mount good. The guy of Thermodyne Hornet is just barely better in its output but not good in its way to mount it. The little Red one I have is a Hurricane and its about the poorest design of them and don’t turn well at all. After working with 13 of these total in 4 years, my experience is they are all just a lie but can do something, just nothing near like they are sold at. At best, 20% and I have put them all on a 6.5 horse tiller motor and none will do what they claim even on a motor. The Thermodyne Hornet and Wind Blue come close, but will get real hot. Just look at the wire size on them and the bearings and you will know its a lie. But I at least tried to make them work. I do get more power from the Hornet PMA he sold me claiming 1200 watts compared to the Freedom that was sold claiming 1800 watts at the time, it changes week to week on his sites LOL! But like you, I know theres no way these can produce what they lie about and all of them are the same thing in different colors and cases. Take them apart, they are the same. Anyone saying different is selling them in my view. Its a sordid bunch taking advantage of peoples ignorance. Vitriolic is my intent and I apologize if it seems that way to you. My issue is with the blatant false advertising by this company consider the follow excerpts. This will be my last post and it is not my intent to annoy you on your own blog. My conclusion is simply Bob green will say anything to sell a wind turbine. Bob Green is advertising the worlds best wind turbine that is for high winds only that on the same page is advertised as a low wind turbine and the best in the world. The implication being that Mr. Green has somehow derived a way to maximize the performance of a Delco wind turbine to provide world class performance for both high and low wind area in a single stator winding? http://hydrogenappliancesDOTcom/Commander.html removing dot. Bob Green clearly states “the worlds best wind turbine” Based on what data? 11 blades for easy start up – Large PMA for lots of high end power. Large Delco PMA? Up to 1645Watts plus! On what planet? The world’s lowest priced production wind turbine in its class! Based on what data? class 2 to 7 wind zones. areas with powerful winds only. Powerful wind low wind make up your mind! What in the world does this mean? I have probably made my point abundantly clear and it is not my point to irritate you. Your entitled to like what you wish and I did not take the post as an endorsement. I simply seek to advise you what about this company is caustic to me. I am not here to kill anyone’s joy but I believe that part of the responsibility of providing information to the public is to be fair and balanced. If you have a problem with Jeff from Missouri wind and solar your not the first and I doubt you will be the last but that does not mean that his competitor should be portrayed in a positive light as a result. Upon reviewing your comments reviewing the video from Missouri wind and solar I concur with many of your statements however regardless of if you like the guy or not in the name of being fair and unbiased perhaps you would take a moment to review the information provided about the instructions provided from the manufacturer of this turbine you “like”. You have made a point to post a 3 phase versus DC power transmission loss analysis which is useful however I would like your input on Bob Green’s instructions on how to wire this DC turbine. Green tells us to use the tower as the ground wire! 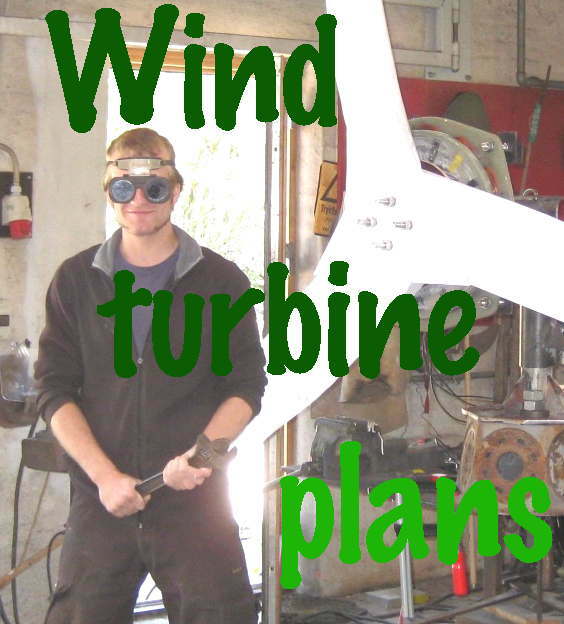 In tiny print that you can only read with glasses Bob from hornet wind , windgeneering , Thermodyne systems or whatever he is going by enlighten us on how to wire a dc wind turbine. In his section on one wire installations under step 7 in the “one wire systems section” Green instructs the user to use the tower as the negative ground wire. “use the pole as the ground” he says. He goes on to state that you need to be careful not to paint the bare metal bracket which is acting as a ground. 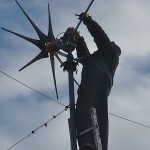 Green instructs the user to carefully paint the turbine bracket in place and be careful not to disrupt the connection to ground the mounting bracket makes to the pole he explains. Presumably the bare connection to the pipe will not corrode if we simply fail to paint it?. If your are going to chastise someone about bad advise to the beginning wind turbine owners lets be fair. What is described in the hornet wind instructions for their product if you will take the time to review it is some of the most shoddy advise I have seen a company give. 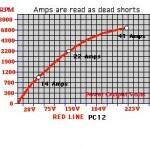 In the former discussion you admirably educate your reader about line loss and tackle complicated issues for the “intermediate users” regarding 3 phase vs DC transmission loss. I would care to hazard a guess that the DC transmission would no longer be more efficient than 3 phase in the case of the instruction provided at the aforementioned URL. Once you factor in one of the conductors being Aluminum; to case hardened steel on a bold to; stamped metal which contacts; the steel pipe. I suppose we can’t call it line loss since there is no line and I will leave the safety issues alone since I find it highly improbable that enough power would be produced to hurt anyone. I find this to be complete rubbish. Green goes on to educate the newbie in his charge controller ads that the power can just be “cut” to the wind turbine and no diversion load resistors need to be purchased because they are expensive http://www.hydrogenappliances.com/batteryregulator.html I do not intent to “kill anyone’s joy” but if there is no need to keep a load on the turbine and it can just spin freely without causing damage what is the purpose of the furling mechanism? As one of your readers when I see you methodically disassemble the instructions one company has given and in essence give the thumbs up to an entity far worse by my standard you have left me scratching my head. In summary if you believe that using the tower as the DC negative connection leg is sound advise then I will leave it alone. I would also concur with your analysis that the 79 watts would result in a 2 kw per day output since the output would likely not be continuous over a period of time. The truth being is this is not a 60 kwh per month machine and I think 20 kwh per month would be generous at best. 10 – 20 kwh per month are typical figure reported by owners of this product even with good wind on tall towers. This figure I might add is not using the tower as the DC conductor. I am a moderator of a fairly popular wind blog myself and have access to many cases of this type of performance reported. Again this is fairly universal and if the godfather of the axial is content with watching a small machine put along at 50 watts-100 watts in stiff wind I guess that is your prerogative. ok john, thanks for expanding our knowledge of these turbines and their shady creators. I am not systematic in my approach to this, and my positive remarks about my neighbour’s machine (bought from a UK source) should not be taken as an endorsement of all things hydrogenappliance or thermodyne by anyone or any means. I am a slow reader and I find the lengthy and vitriolic comments that I have to look at on the subject of these turbines so tedious that I have decided a policy of deleting all the new ones that arrive on the missouri post and am very close to closing comments on this one too. It has been interesting but ultimately depressing. Let me refresh you memory here is an article you wrote back in 2006 for home power magazine which one can only draw the conclusion in my opinion you think using a delco alternator as a wind turbine is a bad idea. The content which led me to this conclusion was the first sentence where you wrote ” Hello Ron, A car alternator is a bad choice for a wind generator. ” Correct me if I drew the wrong assumption but the content is pretty straight forward you go on the explain electrical inefficiency bearing size and other reasons. It is this straight forward writing that many of us who read your blog follow you for. I am not sure if this is rethinking on your part or what. Personally my issue is not with the car alternator it is with the guy that calls the car alternator a 1600 watt wind turbine. the peak power figure is not the one to look at but it is beyond me what your neighbor is going to do with 50-100 watts except hopefully charge the phone to ask you to come build him a wind mill. We are also aware that in normal winds this thing will not make enough power to make most deep cycle batteries move. So I had while I had read your criticism of Jeff I did not take the two as synonymous because that guy does not even sell a car alternator anymore. The point is in the world of small wind power people just don’t get it and these 28 inch blades do not make enough power to do very much. As soon as people have gotten wise to that fact here comes Bob Green with a blade 2-3 inches bigger called a T REX and all sort of fantastic assertions about power output because of the slightly larger diameter. Personally I despise these people who insult the intelligence of everyone in small wind. If you have ever had the misfortune of flying one of these turbine they do what many have called the sword blade dance. The thing spins up until in has enough power to cut in the immediately stall under a load lacking the torque to make continuous power. Thus my confusion by your purring along comment as I have never seen one of these type turbine purr along in anything just short of a gail force wind. I suppose part of my disdain for this company comes from reading the relentless banter of his handful of loyal follower who fill your pages with even more misinformation. I guess they can be a bit intimidating but hell you are Hugh Piggott and have more practical experience flying wind mils than all of them put together. They are not you base readers and will move along when they get though bantering on about Thermodyne Systems, Hornet Wind , Windgeneering and the many other aliases Bob Green uses to confuse people. In any other business I can think of false advertising is false advertising. There is no guy there making excuses for the guy and I take little sanctuary in the statement that” if consumer would have done their research they would have known” For me this is very simple and the name for it is fraud and false advertising. When you label something 1200 or 1600 watts and the NREL and the AWEA all the manufacturers in china. All of the viewer of the otherpower.com blog nor anything you have written about know 24.6 mph or 11 m/s is the rated wind speed and as you can attest you didn’t get more than about 100 watts. Now this company keep in mind has a cover on their youtube channel speaking of 15 years in business? All this business experience yet how to properly rate a wind turbine has somehow eluded the owner? Presumably if you get the upgraded blade with the promises made by this manufacturer you guy can shut the rest of the windmills on the island down and run power lines. Luckily I have evolved way past the need to have someone build a premade kit however I watch these children banter back and forth about who has the best wind turbine and the answer eludes them. We could possibly do better mounting boat oars on a hub. Just my 2 cents but we build axials and I think the the world already has enough garbage in its landfills which is what this product is and where it more often ends up. This is the way this story usually ends up so I guess I need to be a little more patient I feel another blog entry is to follow. OK fair enough you got me, it’s true that I would not recommend anyone start with a car alternator to make a windmill, and there are many good reasons for that. But when I see something working nicely I am not going to say it doesn’t work just because it flies against what I have learned in the past. I like this particular machine because it has a furling system which most of such products do not. That means it furls out at about 20 amps (so I am told) and can never produce the advertised peak output but again for a machine of this size, that output is irrelevant as the blades don’t have that kind of power in any normal windspeed. 83 watts average over the day is enough to produce 2 kWh units of energy in 24 hours, which is a useful amount for an off-grid user. These are the sort of numbers that make sense for a machine of this size. I sometimes think that the amount of energy put into hyping and slamming these machines is ten times the energy they produce into a battery which is a shame. Small wind turbines are a joy. This sort of stuff kills the joy. Wow I have always had respect for you Hugh even when you say thing people don’t want to hear however it is beyond me how you give this piece of trash a free pass so to speak ” referring to 50 to 100 watts output in a stiff breeze as ” purring ” along. I am active on many blogs and am familiar with this company because of the terrible reputation. You obviously have an issue with various other companies as I have read in your past entries but take no issue with Hornet Wind Advertising 1250 watts and measuring 50-100 in a stiff breeze? I am baffled and assume that you would be a little tougher on your own work no? I know you have not taken the same path with other companies in the past. You say “I have seen numerous quotes where you trash delco turbines for various reasons” but I don’t remember them. I guess I must have a poor memory. I may have been hard on Jeff for the nonsense factual stuff he put in that video but I don’t recall trashing anything – just incorrect factual statements. I think 50-100 watts was OK in that windspeed. Good real-world performance for such a tiny thing. 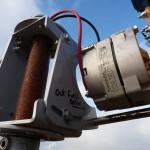 If people bother to do their research they will soon find out that the peak power figure is not the one to look at when buying or when judging a wind turbine, so the 1250 watts figure (which apparently has actually been seen when connected to a 24-volt battery and this is conceivably true) is irrelevant. What matters to me is that this machine is still running after a few days of gales with gusts over 70 mph and it was affordable. I like that, and will hold off an trashing this particular one for a few more weeks until it breaks. I guess its all relative, one style of turbine will make considerably more power than another style in the same wind, i own the pma style and many others and am now building an axial because i want more power in much lower wind. Im seeking killowatt hours not peak watts, im done with that, i wasted considerable money in my ignorance and got little in return ie kwh’s. That one has 7 magnets. There’s other model with 14 magnets, which is less cogging (they said). Is there any other power measurements with some more wind? I believe that for use with a 12v battery, on not so windy zones, the 24V unit should be a better choice. When it comes to purchasing a turbine it’s really about what you’ve been alluding to: getting the best bang for your buck. For about $400, they’re not a terrible investment for the right application. But for $400, an experienced craftsperson would have a damn good start on a great experience building their own off-grid axial flux turbine. First i would like to say my company name was mentioned on this blog as the Hornet Thermodyne wind turbine is similar to the Missouri Wind and Solar wind turbine which couldn’t be farther from the truth. My wind turbines are nothing like the Hornets , Ghost or whatever he’s calling them this week. I was a dealer for Thermodyne in California for a couple of years. I assembled and sold hundreds of his wind turbines, charge controllers and blades. for a good reason, when they were 28″ the tips broke off in the wind. The tips broke off because they were to thin and NOT polycarbonite at all. He did that to put people out of business and it worked. 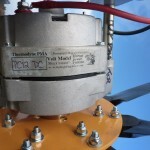 The 7 magnet slant core Delco car alternator PMA is 2 to 300 watts max, period, end of story. I flew those and tested them for years. They are a scam. His blade hubs were 1/8″ thick and they warped so bad that the blades hit your tower and broke off. Damn right Ron Graeffe got mad at me for showing and telling the world his wind turbines and everything associated with them were dangerous , overrated and flat out a scam. His DC water heating elements we off the shelf $8.00 AC water elements with the specs melted off the plastic and he sold those for $69.00 for years until i exposed him on a video. Damn right he’s mad at me. I ruined most of his scams. So don’t make this blog about me, make it about the scam king himself and his dealer Les of Hornet wind in the UK. What are you talking about Jeff? He’s never told me to cut my blade tips off – the turbine’s only a year old, and the blades are still 28″ long, and polycarbonate. Could be better, yes – but so could yours, tho I’m glad to see both of you finally take my advice and focus on increasing your blade and rotor sizes. And 1/8″ hub causing my blades to hit the tower and break? Either you don’t have a very firm grip on reality or you’re an outright liar – maybe both. I’ve never had a problem with that turbine. Ever. And I challenge you to prove otherwise. As far as slinging mud, you’re not in a very good position, so I suggest you take a step back and think about it. I hear sales are down….might be a good time to reconsider your marketing strategy. I was about to delete this but decided to leave it up there as a testament to your character and personality, Steve. i have a 24 volt 900 watt ghost i bought on ebay from hydrogenappliances and h have recently mounted the turbine [not blades yet] and attached weld wires…….and have some questions about the #6 weld wire connections to the pma and mounting pole………if you would contact me back would appreciate it…..